Soundarya Lahari meaning waves of beauty consists of two parts viz. Ananda Lahari meaning waves of happiness (first 41 stanzas) and Soundarya Lahari (the next 59 stanzas). It is believed that Lord Ganesha himself has etched the Ananda Lahari on Mount Meru (Some people believe that Sage Pushpa Dhantha did the etching). It was read from there by Sage Gouda Pada who taught it to Adhi Sankara. Adhi Sankara himself added the rest of the 59 stanzas and completed it. These 100 stanzas are supposed to be the foremost among Manthra literature. It is also believed that by Making suitable Yanthras and reciting particular stanzas and worshipping the yantras almost anything can be obtained in the world. There are more than 36 commentries to Soundarya Lahari written in Sanskrit itself. 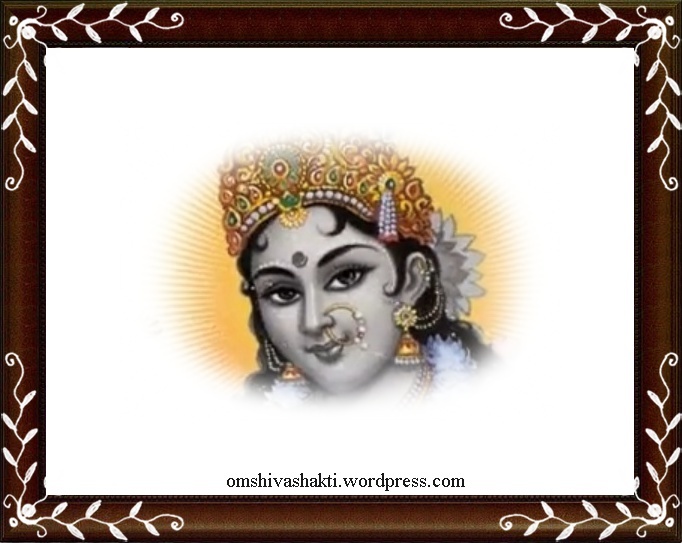 Of them the most famous is that written by Lakshmi Dhara Lalla. His commentary is used to understand the meaning of the different verses. Though there are large number of translations and commentaries of Soundraya Lahari available this is perhaps the first time an attempt is made by a mere novice to translate them in to English verse. The aim is to bring to the notice of the devotees who know English better than other languages, the majesty of the medium of worship called Soundarya Lahari. A transliteration in roman script is also given. May all those who read this be drenched for ever by this Wave of Happiness. The Devotees who use Raja Yoga believe that right below the back bone there exists a very micro nerve called Sushmna. Below this is the mooladhara chakra (The wheel which is the ultimate basis), and two inches above is the Swadishtana (ego wishes wheel) chakra and above that and opposite to the belly button is mani pooraka (the complete gem wheel) chakra and above that opposite to the heart is Anahatha chakra (deathless wheel) and above that opposite to the throat is the Vishuddhi chaka (wheel of ultimate cleanliness) and above that in between the eyelids is the Ajna chakra (Wheel of order ) and in the bottom of the brain is the Sahasrara chakra (the wheel of thousand lotus). They belive that the malefic bad thoughts of men sleeps in the mooladhara chakra in the form of a snake called Kundalini. If the devotee can wake up this snake and lead it through each of the above wheels, step by step and make it reach the Sahasrara, he attains ultimate redemption and sees the ultimate truth behind everything. * The geometric design of Sri Chakra (Holy Wheel) where the mother resides is described here. * A mythical bird in Hindu mythology which is supposed to drink moon light. Who destroyed the three cities. On my head with mercy.